Home Archive by Category "Oceanfront"
This season gonna be so much fun! 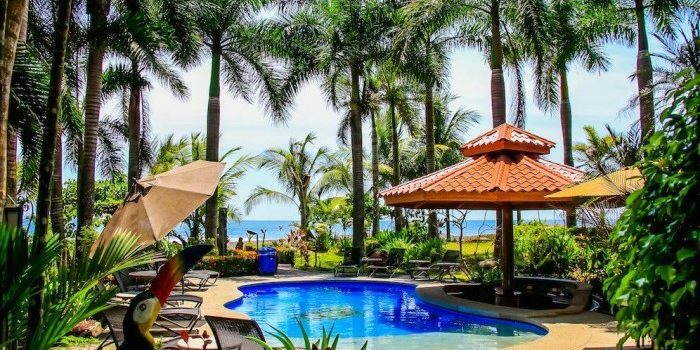 January-March is definitely a good time for a Playa Hermosa Costa Rica vacation. The most popular destinations have hot dry weather and many popular hotels and lodges have some rooms available even a couple of weeks ahead. Later in Feb-March Spring Break reduces availability and raises prices. Wildlife comes out in Feb-March to enjoy the sunshine and gathers at shrinking water supplies as the dry season stretches out. The weather is perfect for surfing and other activities. Advance reservations are strongly recommended for mid priced hotels and lodges in March and are essential for all but budget accommodations around Easter. Many popular places (especially in beach areas) have minimum stays of 3-6 nights for the peak season. The hurricanes in the Caribbean Islands in September 2017 have increased demand for Costa Rican beach destinations in 2018. If you want the flexibility of traveling without reservations you may not get your first choice in Feb-March, but with a good guidebook you should be able to find something – plan on looking for accommodations in the morning. Airfare rarely goes on sale for the peak travel months but if it does it’s usually several months in advance. If you plan ahead and set a fare alert on a search site like kayak.com there are occasional bargains – In late 2015 there were tickets available for less than half price for 2016 peak dates as Southwest, Jet Blue and Spirit had all introduced new routes. In 2018 the 2017 hurricanes in the Caribbean may drive up prices. Depending on the timing of Easter you may consider shifting into February, or April for similar weather with less crowds. Some of the most popular activities of the area are, sea kayaking, river boat tours, whitewater rafting, waterfall expeditions, zip-lining, fishing, surfing, and catamaran tours. Plan your vacation to Marea Brava Beachfront Suites and Villas and experience the tranquility of Playa Hermosa de Jaco! Marea Brava Beachfront Suites and Villas is a beach front, boutique style hotel, located on Playa Hermosa de Jaco. This is not to be confused with Playa Hermosa in the Guanacaste region of Costa Rica’s northwest peninsula. Playa Grande de Jaco is considered to be the best surfing in the entire country, with wave height reaching over 10 feet in height. Marea Brava Beachfront Suites and Villas bring the biggest and best waves from the Pacific Ocean, right to your doorstep! Marea Brava has the comfort of a luxurious hotel, but is small in size, allowing each guests to receive much more personal attention. Hotel amenities include swimming pool, bar, and internet.